Former Brexit minister Steve Baker has shares worth at least £70,000 in a company that encourages people to invest in gold to avoid the financial hit of a no-deal Brexit. The former Brexit minister is set to make the case for a no-deal Brexit in the coming weeks. 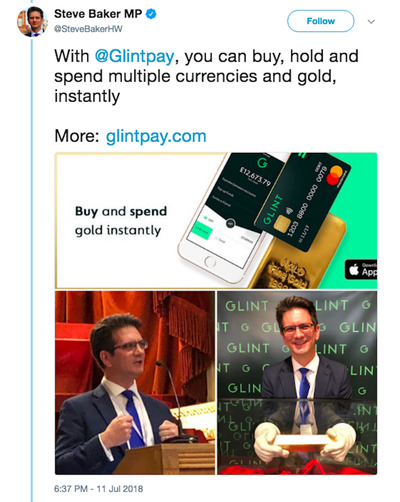 However, he has also promoted and invested in Glint Pay Ltd, which tells potential customers to “buy, save & spend physical gold” to insure against the negative impact of a hard Brexit. Posts on Glint Pay’s website cite uncertainty over Brexit as a reason for the fall of the pound as well as warnings that a no-deal Brexit will be particularly damaging to the UK economy. The company warns that Brexit could hit pension funds and advises customers to buy gold as “insurance” against the UK leaving without a deal. LONDON – A prominent pro-Leave Conservative MP and former Brexit minister has promoted and invested at least £70,000 in a financial services company that encourages the public to buy gold in order to avoid the negative impact of a no deal Brexit. Steve Baker, who belongs to the Jacob Rees Mogg-led European Research Group of pro-Brexit Conservatives, is reportedly working on an “alternative” to Theresa May’s Chequers plan, which will outline the “advantages” of leaving the European Union without a deal. However, Baker, who resigned as a minister in the Brexit department earlier this year, is also a shareholder in the company Glint Pay Ltd, which has encouraged people to “buy, save & spend physical gold,” as”financial insurance” against the potential economic impact of a hard Brexit. Baker attended Glint Pay’s launch earlier this year – two days after quitting the Department for Exiting the EU in protest against Prime Minister May’s Brexit plan – and has repeatedly endorsed the company on his public Twitter account. He has shares in the company worth at least £70,000, according to an entry in his register of interests disclosed on June 22, 2017. The London-based company, promoted by Baker, has encouraged potential customers to invest in gold in order to insure against the growing likelihood of a no deal Brexit, which it suggests could cause the pound to crash and economic growth to slow. On Wednesday, the pound fell for an 11th consecutive day against the dollar, its worst losing streak since the financial crisis. It traded at $US1.27, it’s lowest level in over a year. Baker, the Conservative MP for Wycombe, is yet to respond to Business Insider’s request for comment. They added: Glint’s business model is to reintroduce gold as a global currency, and to allow people to spend and save in gold as the most reliable form of money: independent, incorruptible and fairer, without the long-term depreciation of paper currencies. “Glint’s success as a business is not predicated on the short-term direction of political and economic events, or any Brexit outcome.